Since their mama died and their pa left, Ethan, Alice, Simon, and Will Cooper have not known much of a home. But now that the orphan train has taken them to Mr. and Mrs. Rush in Nebraska, their dreams of home may become a reality. The kids discover that life on a farm is full of challenges. Ethan learns how to drive a plow, watch for snakes, and deal with bullies at the country school. Alice learns to slop the hogs and live with a big sister who isn't exactly welcoming. Will seems to be the only one of the four that their new mother likes. And Simon disappears--again. The third book in the Beyond the Orphan Train series, Prairie Homestead is an adventure in new beginnings and lasting faith. Prairie Homestead by Arleta Richardson was published by David C Cook in February 2016 and is our 2290th best seller. The ISBN for Prairie Homestead is 9780781413572. 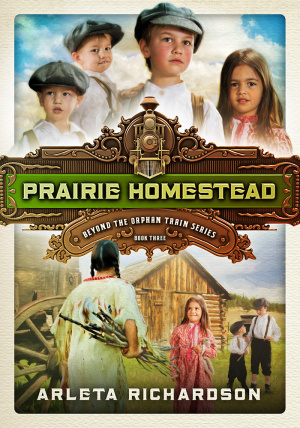 Be the first to review Prairie Homestead! Got a question? No problem! Just click here to ask us about Prairie Homestead.